Ephesus - Enter through the Magnesia Gate and begin a slow, downhill walk with your guide into the ruins of this Roman provincial capital. 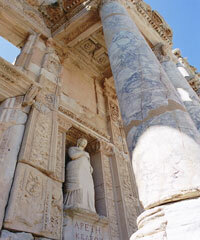 Your route takes you past the Odeum, the Celsus Library, the Temple of Hadrian, the Fountain of Trajan and the Great Theater. The Theater had seating for 25,000, was the site where St. Paul preached to the Ephesians, and is used today for a local spring festival. Didyma - In antiquity, Didyma was connected to Miletus by a sacred road. Visit the ruins of the Temple of Apollo, one of the largest temples from the Hellenistic Period. Despite extensive construction, the temple was never fully completed. Miletus - These ancient ruins lie on a hill near the Aegean Sea. Explore the ancient theater, built circa 4th century BC. The theater could accommodate over 15,000 spectators. Visit the well-preserved Bath of Faustina, named after the wife of Marcus Aurelius, who ordered their construction. Priene - Set dramatically at the foot of a sheer mountain wall, Priene overlooks the aptly named Meander River. This 2500 years old Ionian city was among the first to be planned with a grid system of streets. From the Kusadasi drive through countryside dotted with vineyards, olive orchards and cotton plantations to Miletus, Didyma and Priene and finally to Ephesus. Your tour ends at Kusadasi. - Visiting Ephesus and all other ancient sites includes walking approximately 1 mile over uneven and cobblestone surfaces with inclines and steps. Comfortable walking shoes, comfortable clothing, a hat, sunscreen and insect repellent are recommended. Guests should watch their step at all times in order to avoid injuries. - The tour includes the professional licensed tour guide, all entrance fees, private air-conditioned transportation, lunch and VAT. - Approximate time to reach Didyma is 60 minutes. - The above rate is only valid for Kusadasi Port. If your arrival port is Izmir, please kindly contact us for price and tour details.